Soundtracks for dubbing are recorded in a studio. When you dub someone, you give them a name or title. This comes from an older use of dub, meaning ‘to make someone a knight by lightly touching him on the shoulder with a sword.’ It also means ‘to poke or thrust’ and in golf, in US English, to hit a ball poorly or to miss a shot. As a noun, mainly in US English and now dated, a dub is an awkward or unskillful person. You might know as well that dub is a style of music that grew out of reggae in the 1960s. His name was Sean, but he was so much taller than all the other kids his age, that they inevitably dubbed him "Lofty." He was just plain Terry but became Sir Terry after being dubbed by the Queen. The huntsman dubbed at the stag. The golfer dubbed shot after shot. Don't ask Larry to do it; the fellow's a dub. Maria is a big fan of dub. In movies, to dub means to give a movie a new soundtrack, usually to make a version of the movie in another language. The new soundtrack replaces all the original spoken dialogue. 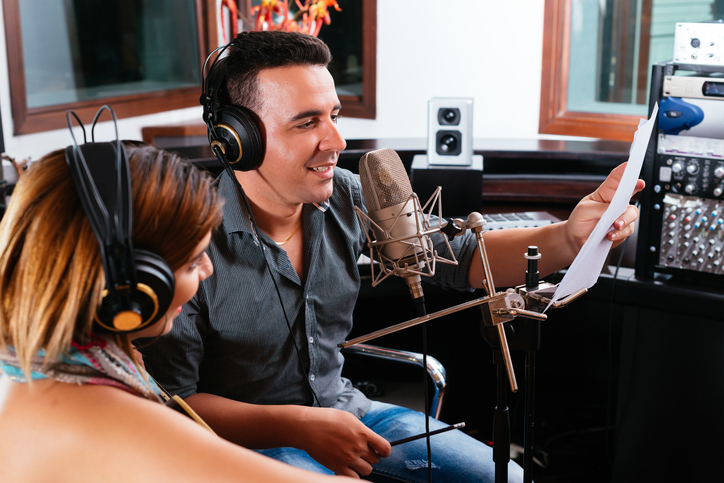 It is different from a voiceover, which is a part of the soundtrack recorded to provide off-screen narration or translation (the sort you often hear on news programs, for example). Dub, meaning ‘to give a name to someone or something,’ dates back to the mid-11th century. The late Old English verb dubbian (later dubben in Middle English) originally meant ‘to make someone a knight by striking them with a sword,’ and probably came into English from the Anglo-French dubber, douber or dobber, from the Old French aduber (to equip with arms or adorn). Its origin before then is uncertain, but most linguists believe it was Germanic in origin, and some point to the Old Norse dubba (to dub a knight), the Old Low Franconian dubban (to strike or beat) or the Old Low German dubben (to trust, poke or strike) as proof. The meaning ‘to give a name’ dates back to the late 16th century, and started as a figurative use of the original sense. Dub, meaning ‘to poke or thrust,’ has the same origin as the prior meaning, but was not really used in English until the early 15th century. The golf meaning, used mostly in the US, dates back to the early 20th century. Dub, meaning drumbeat, is a figurative play on this sense, and the origin of the music style. The film meaning is completely unrelated; it is a shortened form of the word double. Finally, the noun dub, meaning ‘an awkward or unskillful person,’ dates back to the late 19th century, and is probably of expressive origin (along with flub and flubdub, with the same meaning).